If there is a lesson it is that political ends and means cannot simply be jammed together through sheer force of political will, especially when the state is trying to do complex customised things for 6m households. Moreover, one has to wonder if a policy device that can be traced back to Milton Friedman could ever be that neatly adapted to the goals of the centre left, despite the Clinton precedent. Friedman imagined a minimalist, perhaps even brutalist, way of simplifying economic incentives across society. The more the Brownites sought to humanise that vision, the more complexity they added, until the system failed many of the people it was intended to help and gave a progressive policy a bad name. The main tool we have to appease such concerns is data protection legislation. Perhaps we need to supplement this with an independent government regulator for search engines, as Bill Thompson has argued in the past. Equally, it would be nice if search engines entered an arms race in consumer ethics, each trying to out-do the other in the transparency of its data management. Sadly, all of this is rather beside the point. Data protection and privacy laws are of very limited appeal to the broader public, a search engine regulator is only plausible once some scandalous melt-down in data handling has occurred, and if ethical terms and conditions were really a selling point for a search engine then undoubtedly Ask.com would have focused on that for its "information revolution". But it's not and they didn't. Which brings us back to where we started. Oscar Wilde famously wrote that "the problem with socialism is that it takes up too many evenings". Ask.com's "Information Revolution" faces a similar problem. Trying to mobilise people to do something which isn't convenient and won't directly benefit them is hard at the best of times. When you're trying to do so in order to prop up your bottom line, you deserve the utmost failure. 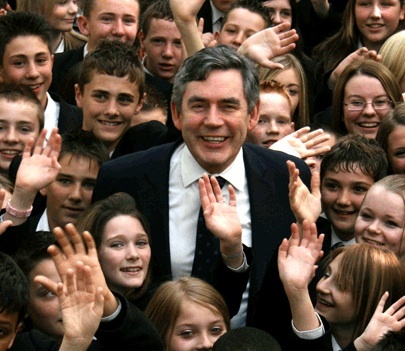 Is it just me, or does the photo on Gordon Brown's new campaign website appear to have been doctored, to super-impose Brown onto a photo of school children? Or is it a card-board cut-out Brown plonked in the middle? And what of the ghostly disembodied hand emanating from inside Brown's jacket? Something's not right anyway. Further evidence of dark under-hand weirdness in the Brown camp me thinks. Political semioticians will note that Brown has adopted the waste-deep-in-kids pose before, when he appeared in what to my mind was the televisual event of the decade, 'Gordon Brown Meets the Ten Year-Olds'. For those who missed it, typical exchanges went something along the lines of this. 10-year-old: [sounding suitably cute] "I like riding my bike. What would you do about this if you were Prime Minister"
GB: [adopts romantic far-away look in eye, while still doing that thing with his chin] "You know, I used to ride a bike as well in Scotland, and I too loved the comfort, freedom and joy of the bicycyle. And it's young bicyclists like you that make me feel proud to be British and make me want to give more people a chance to ride a bike.... [loses romantic far-away look in eye] Which is why I've invested MORE in transport, MORE in renewable fuels, and MORE in cycle lanes. Unlike the last Conservative government which spent LESS to support cyclists in the 9-11-year-old bracket, and voted AGAINST the Cycling Children's Tax Credit which I introduced in 2002. And thanks to a decade of low interest rates etc etc"
... as opposed to what, Tony? Believing you were wrong? Forgetting the moral dimension altogether? Blair's resignation speech shows, yet again, that he is a man completely obsessed with his own conscience, far more than he is with his own image. And, despite what we might think we think about vanity, it is in many respects a safer and more democratic force in politics than profound moralism, for the simple reason that it draws on the opinion of others. I doubt any political leader has taken decisions without considering their moral dimensions, unless you believe that Stalin, say, was actually insane. And by the same token, once the moral dimension enters the equation, 'right' is always going to appear better than 'wrong'. But what marks Blair out is his utter blindness to other forms of justification for political actions. "Believe one thing if nothing else - I did what I thought was right for our country", is his final appeal. But how about "believe one thing if nothing else - I obeyed international law" or "believe one thing if nothing else - I acted in accordance with democratic process" or "believe one thing if nothing else - I tried to minimise damage to cultural heritage". Each of these other three justifications would, in isolation, be equally troublesome. Respectively, legal fundamentalism, democratic fundamentalism and blind Toryism would all have their associated pit-falls (although, with the possible exception of the second, it's difficult to see how they could destroy more human lives than Blair's). But then Blair's folly was not to consult his conscience; it was to only consult his conscience, and then to turn a deaf ear to the other voices which contradicted it. Yesterday he said "In time, you realise putting the country first doesn't mean doing the right thing according to conventional wisdom or the prevailing consensus or the latest snapshot of opinion - it means doing what you genuinely believe to be right. Your duty is to act according to your conviction." But what is the source of your conviction? This is the circular ethics familiar to existentialists. "I have decided to act authentically" is the proclamation of the existentialist, "which means that I will do only what I deem authentic". The rest of us then simply have to hope that this doesn't harm us. This circular reasoning explains why, despite everything, Blair has succeeded in remaining strangely popular and respected. Maybe with the help of those strong communication skills that the Commons Lobby finds so endlessly arousing (Nick Robinson in particular) he asks us to imagine ourselves in a situation that all human beings, by virtue of existing, can relate to: imagine you were alone at 3am, asking yourself what to do? Imagine you were in dialogue with nobody but your own conscience, knowing that lives depended on your decision? Suddenly the decision Blair actually took can seem a little arbitrary (like all existentialist decisions) and insignificant compared to the authenticity with which he faced up to it. Because Blair speaks to us in the most stripped-down ethical language available, that is, as one human being to another, we start to develop empathy for the fact that he had to confront such a situation and that he didn't shy away from it. In this respect, Blair succeeded in the quite extraordinary political achievement of forcing a large swathe of the British public to experiment with a philosophical tradition that runs from St Paul via Augustine to Sartre. But the fact is we don't know what it is like to be Prime Minister, and if we do, we should be worried. The job of Prime Minister is not - or shouldn't be - defined by the experience of lying awake at 3am, with nobody to talk to but our conscience. It is about listening to expert advice, discussing matters in parliament, consulting lawyers, negotiating with foreign leaders (surely Blair's outstanding quality, incidentally), dealing with the media, reading policy documents, striking deals with political rivals and allies, engaging with multilateral bodies and so on. The empathy Blair asks from us is utterly false, and we should not let him get away with it. Yesterday saw the launch of the website of the Media Standards Trust, an exciting new initiative which will seek to generate discussion, research and improvements regarding the media's role in society. I'm a trustee. The website will be an important part of this, bringing together online debate with resources and other stuff. See also the blog of Director, Martin Moore.